Feeling parched? It only takes 5 minutes to treat your skin to a much-needed surge of maximum moisture. 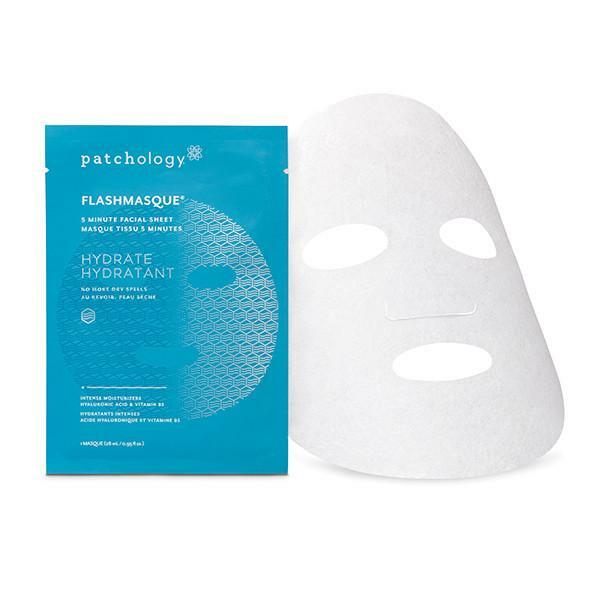 Hydrate FlashMasque 5 Minute Sheet Masks combat dehydration and ease your facial fatigue. You’ll look youthful and dewy every day. Unfold the masque and apply to clean, dry skin. Place over your entire face, pressing the material snugly into facial contours. Leave on for 5 minutes (or longer if desired). Remove the masque. No need to rinse. The serum with fully absorb into skin. Follow with your normal skin care routine. Whether it’s the dead of winter or height of summer, the elements don’t always play well with our skin. Hydrate FlashMasque® 5 Minute Facial Sheets send in a much-needed surge of moisture to ease the tensions. Traditional sheet masks take up to 20 minutes to work. But our advanced masque material accelerates delivery of essential ingredients Hyaluronic Acid and Vitamin B5 to improve elasticity and smooth your skin. And our highly advanced HydraSurge5™ Moisture System deeply hydrates for even more moisture. Try one anytime you’re feeling parched. They’re here to plump you up. Ideal for dry skin types or any time skin is fatigued and dehydrated.